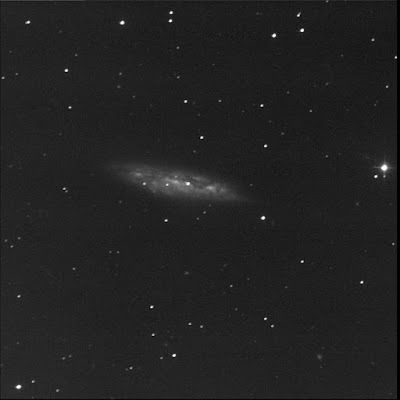 The Burke-Gaffney Observatory robot imaged M108. A galaxy in Ursa Major. Another target from Chuck Messier's list that I visited only once, back in August 2010. Not a great image (with strange artefacts) but it'll do. The big edge-on galaxy is mottled and textured with prominent dust lanes in the foreground. It looks like, to me, that large structures are sticking out of the galaxy's disk. Wild. Very three dimensional. Seems to be glowing from within. Well, it is. But... The core is not bright (or is hidden). Reminds me of the active galaxy M82. There appear to be many small and distant galaxies in the image. West of M108, near the bright star, is a very tiny oval smudge. This is LEDA 2509962. South-west, far away, near the bottom-right of the image is a large round ball of lint: LEDA 2505260. 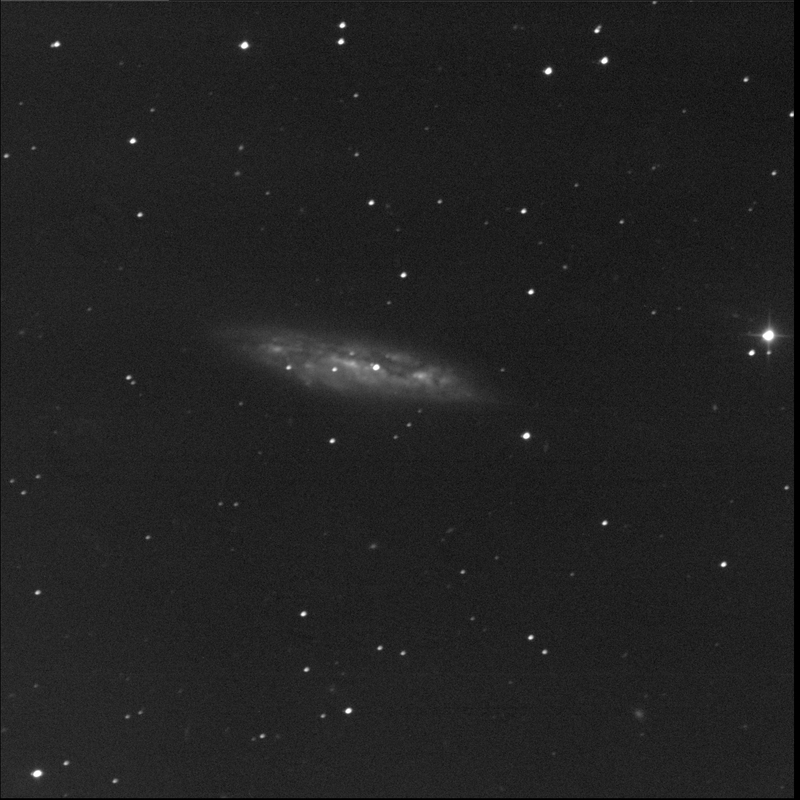 I missed it in my first glance but just above this large galaxy is a tiny faint almond canted: LEDA 2506141. LEDA 2507972 (to the west) and LEDA 2507703 (east) are south-south-west of the big galaxy and a short distance away. North-east of 108 is a nearly round small but bright fuzzy: LEDA 2513272. SkyTools does not noted it but it looks like there's a nearly identical galaxy to the north.